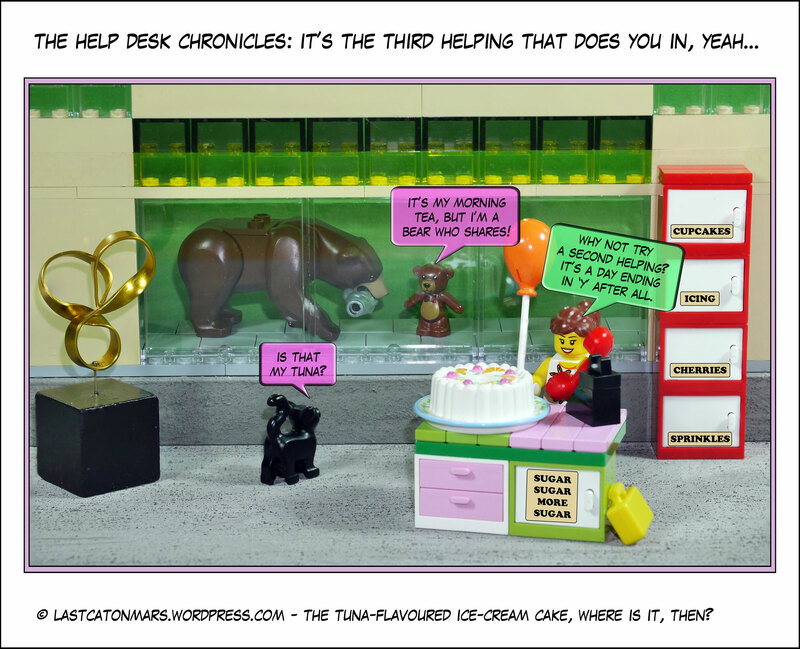 Last Cat On Mars Presents: The Help Desk Chronicles – What’s in a Name, a Couch, that’s what. Since time immemorial (whatever that means), we have all searched for comfort. The humble couch is the answer, as we all know, or should. So next time you need a break, get the chocolate, the chocolate tuna, and the other tasty TV treats and don’t bench yourself, couch yourself, in glowing terms as well. Enjoy, and you’re welcome. 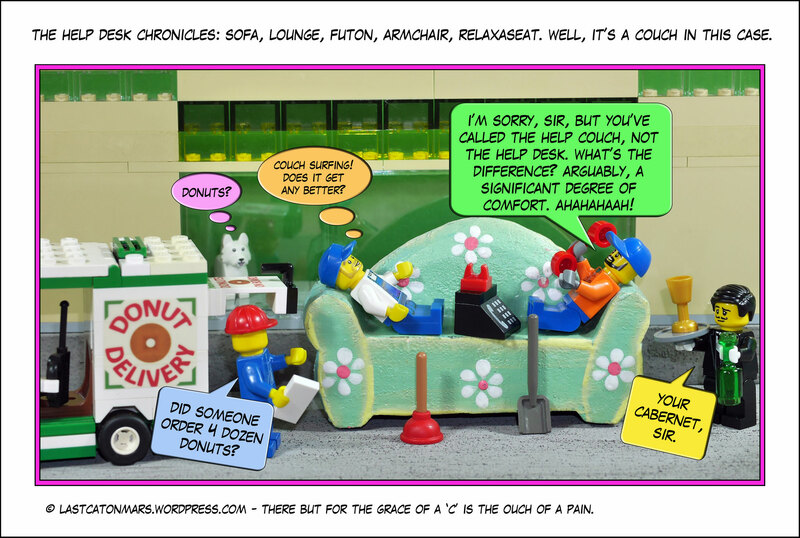 This entry was posted in Help Desk and tagged cartoons, comics, couch, dog, donuts, help couch, Help Desk, lego, minifigures, servant, wine, workers on September 26, 2018 by Jay Verney. If you need help, ask for it. You’ll be surprised who might step forward with wonderful suggestions about 50 ways with tuna, for example, and so on. Do try it, it can be a lovely experience. Just don’t ring this help desk, well, not today, anyway. 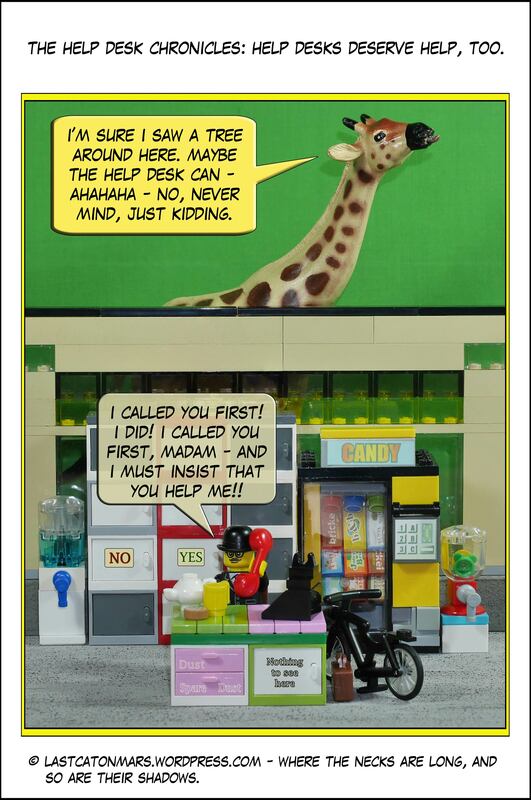 This entry was posted in Help Desk and tagged cartoons, comics, giraffe, Help Desk, lego, minifigure, office on September 12, 2018 by Jay Verney. 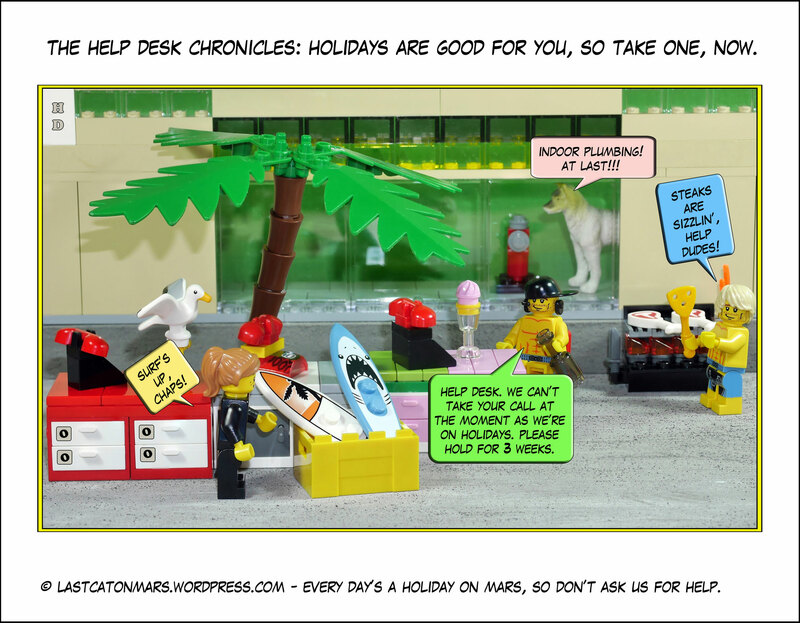 Last Cat On Mars Presents: The Help Desk Chronicles – Have You Tried Self-Help? Imagine how many millions, perhaps billions, of self-help texts there must be in the world. No, do not do that, you will become extremely depressed and need a self-help text to help you, which it won’t, obviously. I mean, look at the state of the world. So, why not move to Mars and read poetry instead? You know you want to. 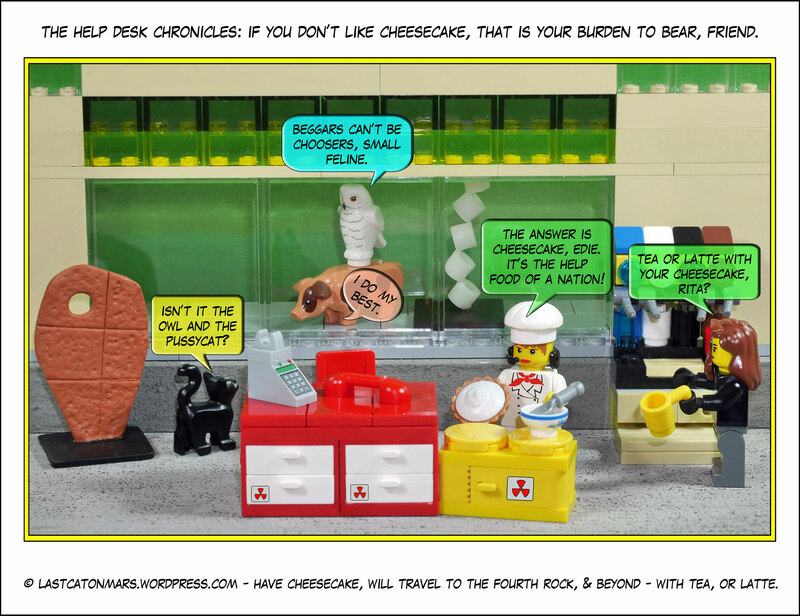 This entry was posted in Help Desk and tagged cartoons, comics, cows, farmer, Help Desk, lego, minifigures, office, pitchfork on July 18, 2018 by Jay Verney. 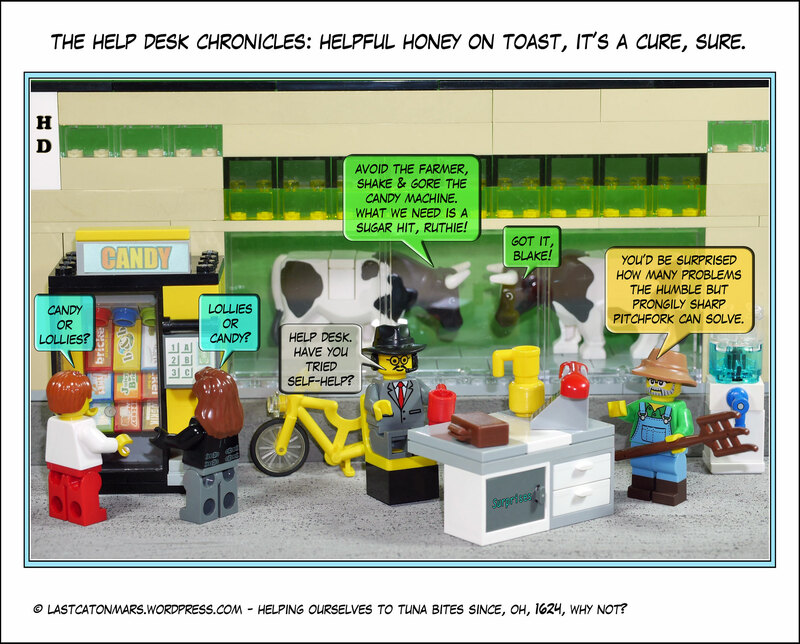 You don’t need the Help Desk to tell you a break is a good thing, right? Or, maybe you do, in which case, break now and enjoy a fine whine, or perhaps simply a little whinge to your friends before you clock back on. This entry was posted in Help Desk and tagged bbq, cartoons, comics, dog, Help Desk, lego, minifigures, office, palm tree, surfboards, surfers on July 4, 2018 by Jay Verney.